Bernard McNamee’s is Trump’s FERC nominee, and like most Trump nominees to any office has attracted an uproar. Back in February, Utility Dive released a video (not playable by the general public without subscriptions or some other "privacy" issue) featuring McNamee disparaging renewable energy and referring to fossil fuels as “key to our prosperity, our way of life and also to a clean environment." McNamee went even further, calling Green Movement “administrative tyranny” and the conflict between polluters and regulators “a constant war between liberty and tyranny.” Now Donald Trump wants to put this corporate fox in charge of fossil fuel henhouse at FERC. Apparently it is not enough that FERC had already earned a reputation as the gas industry's eminent domain rubber stamp even during the Obama years. 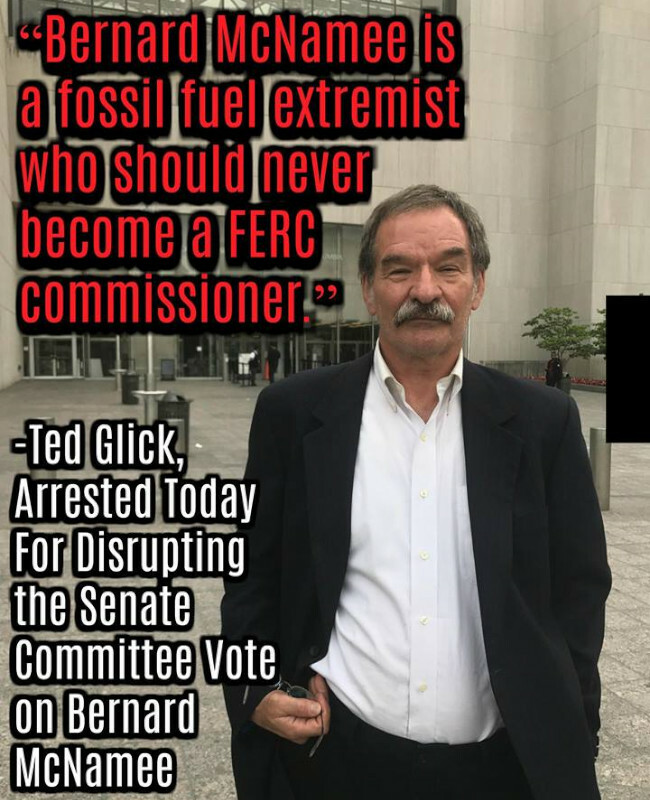 After the protest, the Senate Energy and Natural Resources Committee proceeded to vote 13-10 in favor of confirming Bernard McNamee.Oil Change International reports that the 13 senators who voted for this confirmation have taken almost $10 million in "contribution" (bribes) from the fossil fuel industry. By voting to confirm Trump's fox to watch the FERC henhouse, they were putting their money where their mouth is just as much as any fox with a mouthful of chicken feathers ever did. McNamee still has to be confirmed by the full Senate, so activists have one more chance to stop this assuming the vote does not go "party line" with all GOP Senators voting in lockstep to confirm another thug for Donald Trump.